OMG. I’m running late. I slept in until 6:30! Usually we're up at 5:30am. Don't ask why. I don't know. So today starts off in a flurry. And flurries in the air, too. But I work from home, you may say. Still, one has to stick to a schedule... it’s good for your constitution. After 24 hours of culturing. This batch was still fairly sweet. I decided to stop it then because I was adding flavourings. The longer it goes, the tangier it will get. I’m beginning to get back into doing all the “messy” looking things I had to forego when the house was for sale. No one wants to see yogurt culturing when they view your kitchen. It’s not really messy, but when selling a house you try to de-clutter as much as possible. To make yogurt I use a Dutch oven, heating pad and a cooler bag. You need something (the bag and pad) to keep the temperature at about 80°F for 24 hours. My spouse has recently found the joys of coconut yogurt. It can run up quite a bill at over $4 for a 500g container. Liberté brand is our favourite. It’s thick, tangy and delicious. All their flavours are amazing. So half of this yogurt is my attempt at replicating it; the other half is blueberry. I happened to have a bag of frozen wild blueberries that made the trek to the country with us. 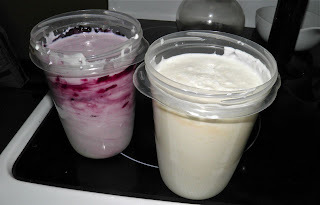 Making yogurt at home is very easy, and very cost effective. For the cost of a 2L whole milk you get about the same amount of yogurt. Some whey is drained off but you still get a lot. The longer it cultures the tangier it gets, too. So you can control the taste of your yogurt quite easily. Give homemade yogurt a try. You’ll be amazed. 5 minutes until very syrupy. Buy your powdered milk at a bulk food store. You only need a little and it's a ridiculous price at the grocery. Heat the milk, skim milk powder and skim milk to 185°F. This denatures the milk protiens. If you don’t heat the milk properly you may get stringy/ropey yogurt. It’s still good, just not as good. Remove from the heat and let cool to 110°F. Whisk in the purchased yogurt, cover and keep warm (about 80°F) for 24 hours. I use a camping cooler bag and a heating pad on the bottom, set on high. The longer the milk cultures the more tangy the yogurt will become. 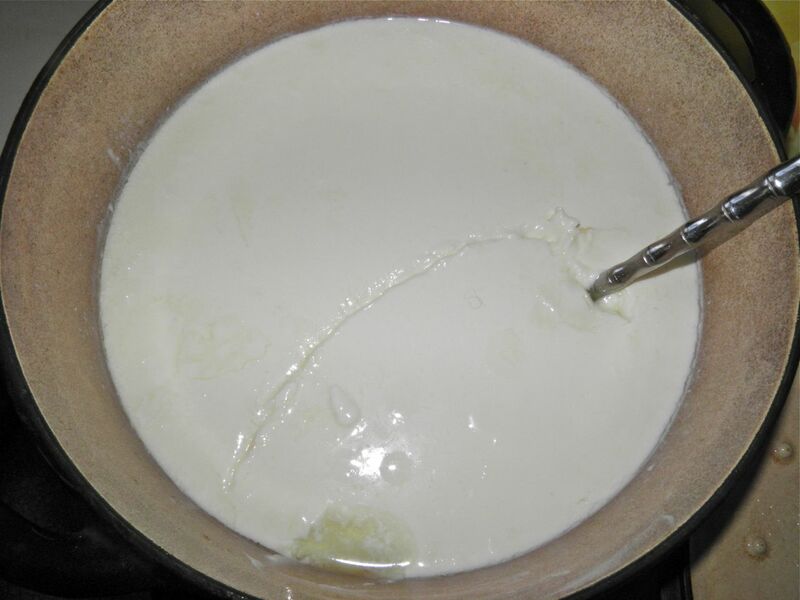 Strain the yogurt through cheese cloth for 1-2 hours. You should get about 2 cups of whey and the yogurt will have solidified more. Save it for another use. 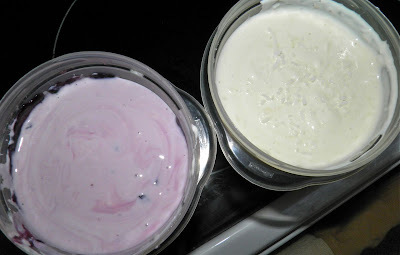 Divide the yogurt between two separate containers. Twice the amount of yogurt for the cost of a 500 ml. Mix into the yogurt, cover tightly and and refrigerate. Mix the sugar and blueberries together in a saucepan. Bring to a boil and let boil for 5 minutes, stirring constantly. 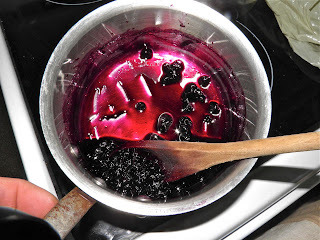 At the end you will have blueberries in a thick syrup. Add the syrup and vanilla to the other container of yogurt and stir. Cover and refrigerate.